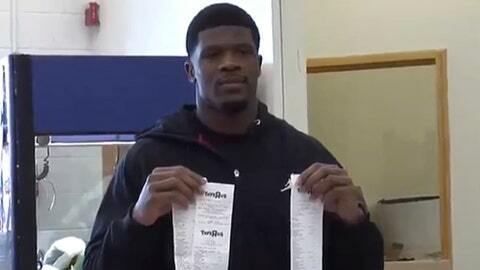 Houston Texans wide receiver Andre Johnson paid more than $17,000 so local kids can have a merry Christmas. Tuesday morning, Houston Texans wide receiver Andre Johnson became one of the most popular people in town. Johnson treated 12 children and their siblings to a shopping spree at a local Toys R Us. As a part of his seventh annual toy giveaway, the kids, selected by child protective services, had 80 seconds to grab whatever they could off the shelves in addition to receiving a game system with two games. The total bill cost Johnson $17,352, but he didn’t mind one bit. "It’s the holiday season," Johnson said. "It’s a time for giving. People that know me know that I have a big heart and that I like to give back and help people out. So that’s just why I do it." "It’s fun," he continued. "It’s fun for the kids and it’s fun for me. It’s something I enjoy seeing every year, so I figure why not keep doing it?" This certainly earns Johnson a spot on Santa’s nice list this year.